Great weather makes for quick exterior work. 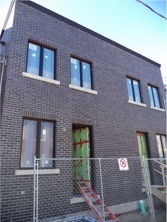 At Allen Avenue the brick work and stucco work have been completed. At Allen Avenue the brick work and stucco work have been completed. Our vision was to build a contemporary style modern home and as you can see, things are very quickly coming together. 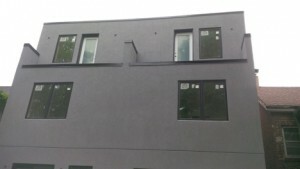 A dark, grey coloured brick was chosen to match a light grey stucco colour. Staining the front door will add character to this building and the porch out front will complete look. We can’t wait until this is finished! Check out a few of the pictures down below. We’ve included a bit of information about the process and, as usual, our reasoning behind the techniques. Anything you would do different? 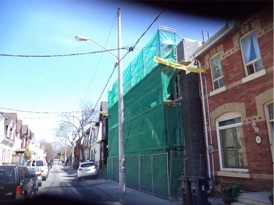 Electrical lines covered with safety plastic, scaffolding installed with a safety mesh installed in case of falling materials. The front is looking sharp, but still needs those final touches. 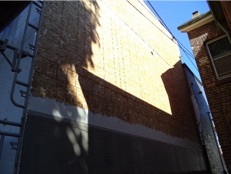 The rear of the property was insulated with expanded polystyrene (or EPS; it’s also occasionally known as Styrofoam board). This adds insulation value to the outside of the building and gives the stucco compound something to bond to. 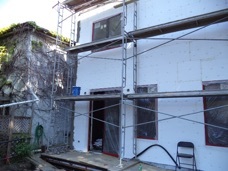 The sides of the house have a layer of non-combustible cement board installed with the stucco compound applied overtop of it.